Programming on the Disney Channel is very special to me. I’m sure I’ve mentioned it before but if you’re new here, I’ve been a fan of Disney channel since childhood. The first program I watched was The Mickey Mouse Club, (ok not the original) but there’s huge spot and the cast of Coop and Cami did not disappoint. If you’ve never watched Coop and Cami, meet the cast: Dakota Lotus, Paxton Booth, Albert Tsai and Ruby Rose Turner. Now let’s chat! TURNER: They love the episodes and I’ve actually brought them to set a couple times, and so it’s really cool. It’s fun how they can see all of it go down. LOTUS: Yeah, my siblings are really proud of me and really supportive. I’m just so thankful that they’re just there for me all the time. Yeah, it’s awesome. They’re really happy to see me. How do you feel working for Disney? LOTUS: It’s a dream come true, man. BOOTH: It’s amazing, and the best part is the wand ID. You actually, they don’t tell you what to say. You get to say whatever you want. Yeah, so you get to pick, like, what you want to say. You could say 20 different things if you really want to. Like, you could flip your wand at the same time as you’re saying it. Like, it’s amazing. I know you hear this all the time when it comes to television program sets, but there truly is a chemistry between this group. One of the cutest moments during the episode when Booth told us that he is the test pilot for stunts on the show. He mentions being in harnesses a lot during filming. There is a scene in Would You Wrather Get a Moose Angry where he is in a stocking and that required a harness. He mentioned this stunt wasn’t as big as other’s he’s done but it was a lot of fun. 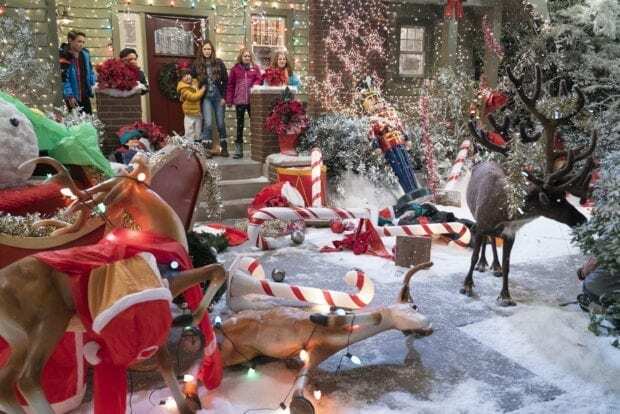 “Would You Wrather Get a Moose Angry” – The kids work together to try and make Jenna’s wish of a classic Wrather Christmas come true but a major snowstorm and a disgruntled moose disrupt their Holiday. This episode of “Coop & Cami Ask The World” airs Friday, December 7 (8:30 P.M. ET/PT) on Disney Channel. Synopsis: Made for kids and families, the live-action comedy follows Cooper (Lotus) and Cameron (Turner) Wrather, two middle-school siblings who co-host Coop’s online show “Would You Wrather.” With the help of their little brother Ollie and Coop’s best friend Fred, the duo present out-of-the-box questions and results to the show’s millions of followers (aka Wratherheads) who help them solve life problems – both mundane and madcap. Every day is an adventure in the Wrather’s hectic household, which also includes their older sister Charlotte and mom, Jenna. Whatever the question or result, Coop and Cami tackle adolescence and everyday family situations with humor and heart. For the fulle interivew go check out my YouTube page! These kids are superstars in the making! Can’t wait to see them all soar and achieve their goals and dreams! The Disney Channel can be watched live, streaming or on demand.